How is ABA Connect different than my current LISTSERV? Who do I contact with questions about my community? How do I adjust my profile privacy settings? What is a Speaker/Author profile? How can I customize my Community Notifications? How can I customize my other email preferences? What is the difference between a ‘community’ and a ‘committee’? Which communities do I belong to? How do I join other communities? How do I respond to others’ discussion posts? Should I post discussions using email or the online platform? Can I attach library items to my discussion post? Can I search for posts? Who can see my discussion posts? How do I use the Member and Topic Tags? Can I delete my discussion posts? How do libraries get populated with items? Is there a maximum file size? How do I upload a library item? What are Library Item “tags”? Who can see my library items? What is a Community Event? What is a Community Blog? How do I find a Community Member? How do I find an ABA Member? Q: What is ABA Connect? A: ABA Connect is an online and email platform for networking, exchanging ideas, getting advice, and interacting with fellow lawyers and legal professionals with whom you share similar areas of interest. Q: How is ABA Connect different than my current LISTSERV? A: ABA Connect not only provides an easier interface for email exchanges, but it also includes an interactive online web platform that allows you to search for previous messages, peruse shared documents, and voluntarily join other communities right on the spot! A: A community is an online space for ABA committees and section members to share resources with other members through discussion threads and a shared library. Communities can also include great features like a community blog and membercreated events like recurring conference calls, impromptu meet-ups and much more. Q: Who do I contact with questions about my community? A: Every community has a Community Administrator on staff here at the ABA. 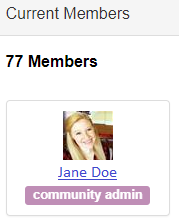 To find out who your Community Administrator is, navigate to your community homepage and look for the member profile image with “Community Admin” underneath their name in the member list. A: Log in at http://connect.americanbar.org. Click the “Login” button the upper righthand corner, and enter your My ABA login credentials. If you have trouble logging in, you can reset your password by clicking “forgot my password” or contact the ABA Service Center at service@americanbar.org or call 800-285-2221. A: Your colleagues want to get to know you. Be sure to fill out your Bio Information, Education, Contact Information, and other profile areas – these details will help your colleagues find you and connect with you in the Member Directory. A: Start by finding the “My Account” tab in your member profile. From here, you can set up how you want to receive emails from the community, how much of your profile you want visible to other members, the signature area that appears under your discussion posts, and more. 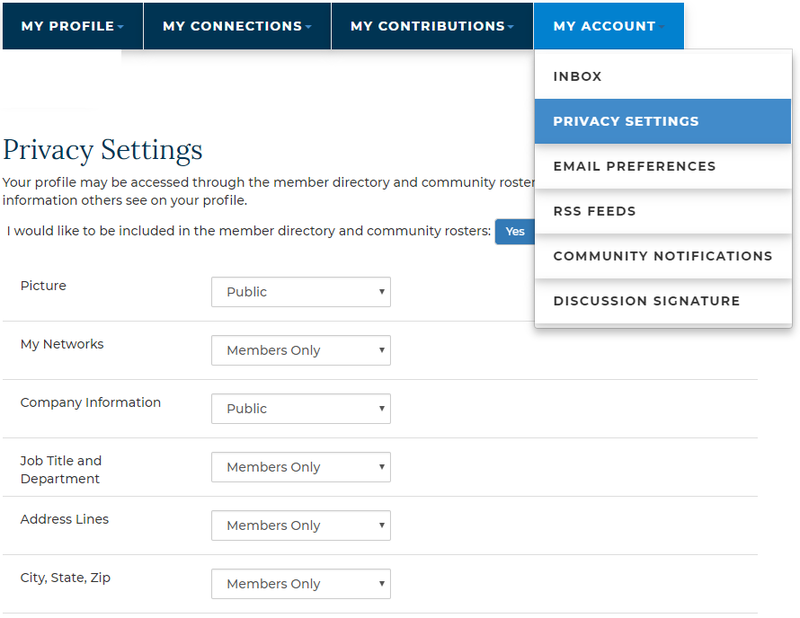 If you have any questions about certain settings, you can contact your Community Administrator located in the member list on your community homepage. If you’re unable to find your Community Administrator, contact the ABA Service Center at service@americanbar.org or call 800-285-2221. A: Much of your basic profile data comes directly from your My ABA profile. This includes your name, email, and other items such as: committee membership, areas of interest, location, education, practice setting, etc. You can edit your profile information directly in ABA Connect using the pencil icon next to each section. All profile changes may take up to 24 hours to populate in ABA Connect. Q: How do I adjust my profile privacy settings? A: Click on the “My Account” tab in your member profile and select “Privacy Settings”. This will let you control what information is visible to whom. After you’ve made changes, click the “Save” button at the bottom of the page. Q: What is a Speaker/Author profile? 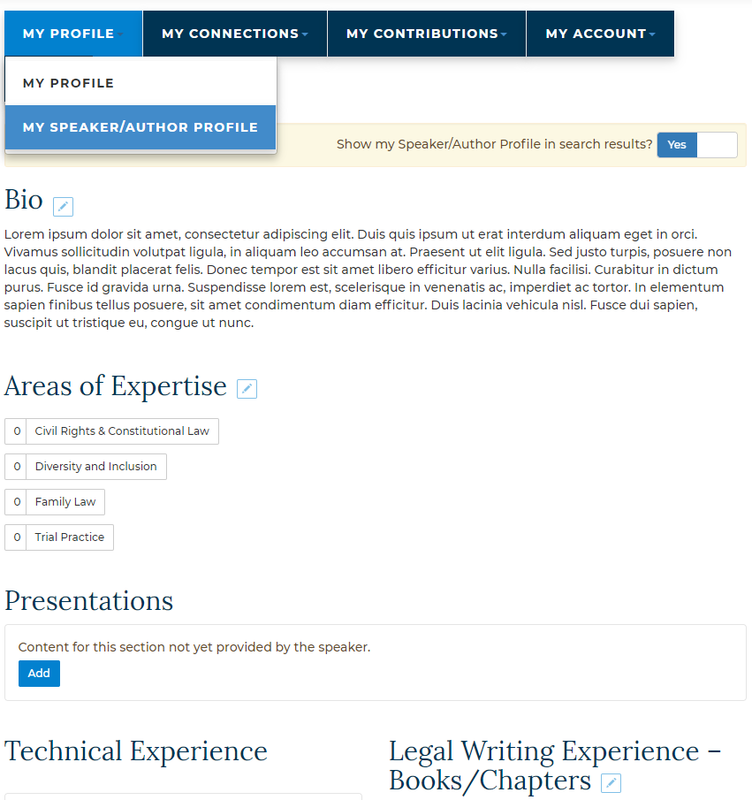 A: In addition to your ABA member profile, you have an additional Speaker/Author profile. This additional profile provides an opportunity for you to expand your impact to the legal profession by highlighting your strengths as a speaker or author for ABA staff to consider for future opportunities including relevant publications, presentations, speaking engagements, and more. You can access and edit your Speaker/Author profile by selecting the “Speaker/Author profile” dropdown item underneath the “My Profile” tab in your member profile. Please Note: Due to the personal nature of the information included in your Speaker/ Author profile, visibility settings are restricted to ABA staff and administrators only unless otherwise specified by the member. Q: How can I customize my Community Notifications? You can apply any of these notification settings to multiple communities in the “Community Notifications” section under the “My Account” tab in your member profile. Q: How can I customize my other email preferences? Social Emails: Emails reflecting one-on-one interactions (ex: reply to sender, direct messages, contact requests, @mentions). Promotional Emails: The ABA does not send marketing emails to community members in ABA Connect. 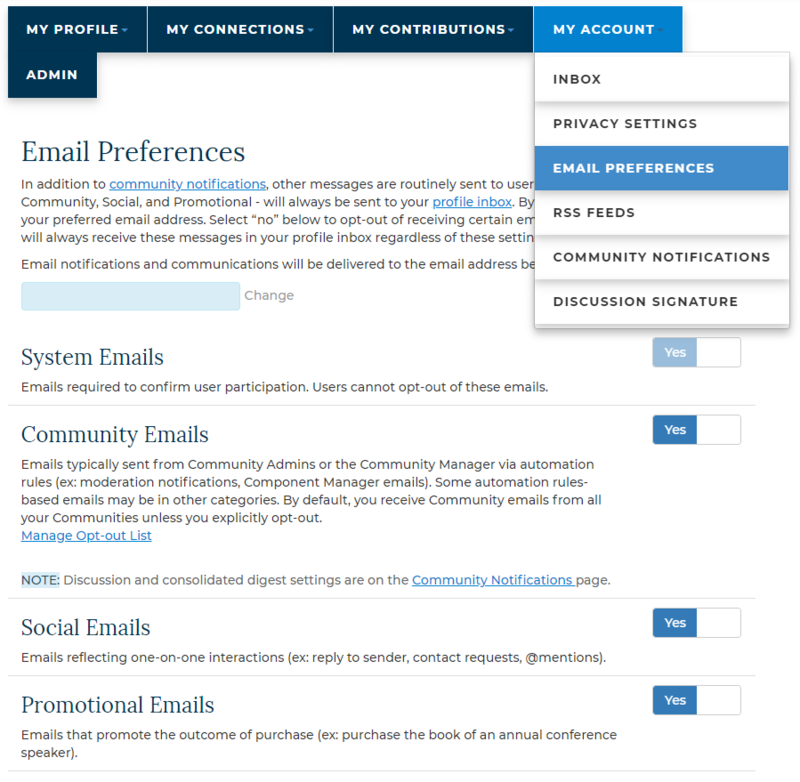 If you wish to update your email preferences regarding marketing emails you receive from the ABA, login to your My ABA account at www.connect.americanbar.org and select “Email Preferences”. A: A community is an online space for ABA committees and section members to share resources with other members through discussion threads and a shared library. Communities can also include great features like a community blog and member created events like recurring conference calls, impromptu meet-ups and much more. Q: What is the difference between a ‘community’ and a ‘committee’? A: A community is a collaborative space for either one or several committees to discuss relevant topics. A committee is a formal group developed by a particular ABA entity or initiative. One to One: This community belongs to one committee. All discussions and library items in this community will only be shared with your committee. When you join this community, you will automatically be placed on the corresponding committee, and likewise, you will automatically become part of the community when you join a committee. Combination: This community encompasses several committees. All discussions and library items in this community will be shared with several specified committees. Usually, there is a list of those included committees on the community landing page. When you join a combination community, you will not be placed on any of the corresponding committees. To join a formal committee, visit your My ABA profile at www.connect.americanbar.org and select “Join a Committee” to join committees that you do not already belong to. If you would like to know more about joining committees and/or communities, please contact your Community Administrator. Open Forum: This community does not involve any formal committees. It is open to any members of a specified entity to discuss relevant topics. Q: Which communities do I belong to? ‘My Communities’ Menu: In the main navigation menu, you will see a menu item on every page titled “Communities”. Select the “My Communities” option in the dropdown menu. Member Profile: Click on your profile photo or avatar in the top right corner of any ABA Connect webpage to access your member profile. In your profile, click on the “My Connections” tab, and select the “Communities” option in the dropdown menu. Q: How do I join other communities? Once you find a community you want to join, click the “Join” button and select your prefered email notification method. Then, you’re all set! 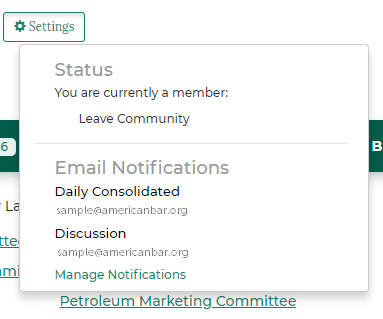 PRO TIP: To see all available communities across the ABA that you are eligible to join or view, click “ABA Connect” in the top right corner of the page. Then, select the “All Communities” option in the “Communities” dropdown menu. A: While you’re on the community landing page, you will see a “Settings” button by the community title. Click on “Settings” and select “Leave Community”. This will remove you from the community. Online: Navigate to the community you want to post in, click the “Discussions” tab then click “Post New Message”. Email: Compose a new email in your email provider (Outlook, Gmail, etc. 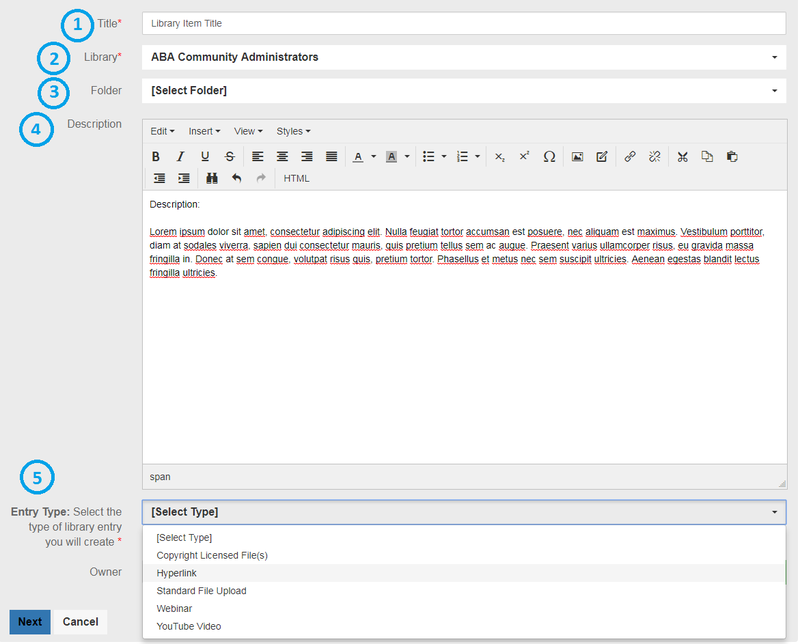 ), insert your community’s email address, and click “send” when your message is complete. Email Notification: When you receive an email notification (either Real-Time or Daily Digest), there is an option located under the Community Title at the top of that email to “Post New Message”. Q: How do I respond to others’ discussion posts? 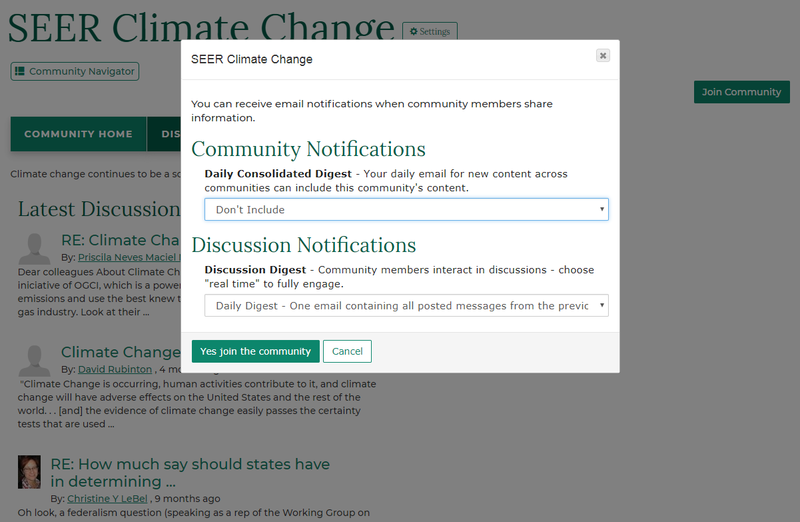 Online: Navigate to the “Discussions” tab in your community, click on the discussion you want to reply to, then click “Reply to Discussion” in the post you wish to respond to or click the dropdown arrow next to the button which allows you to “Reply to Sender” privately. Email Notification: When you receive an email notification (either Real-Time or Daily Digest), there are reply options located above the discussion post. Click “Reply to Discussion” or “Reply to Sender” to respond. You can “Reply to Discussion” which posts your reply to the discussion thread and is visible to all members of that community, or you can “Reply to Sender” which sends your reply privately to the person who posted that particular discussion post. Q: Should I post discussions using email or the online platform? When you post a discussion and/or reply online with an attachment, you can choose a specific folder for that item. When you attach a library item via email, that item is placed in the general community library folder, and you’ll need to login online to move the upload to the appropriate folder if necessary. The online platform includes a wholistic view of the entire discussion thread which provides context and supplemental information for further replies. Replying online gives you an opportunity to explore the sender’s profile and connect with other community members in the Member Directory. Online discussion posts incorporate Member and Topic Tagging capabilities. Q: Can I attach library items to my discussion post? A: Yes! You can attach relevant documents and files to any discussion post via email the same way you already attach other documents. See “07. Libraries” on page 17 for more details about adding library items online. Q: Can I search for posts? Q: Who can see my discussion posts? A: If you know which library the resource might be located in, find the committee on the appropriate committee home. Click through the committee's home page, then click on the “Library” tab . If you do not know where the resource might be, enter search terms in the main search box the same way you might enter search terms into Google or another search engine. Q: How do I use the Member and Topic Tags? A: When you publish a discussion post or library item online, you can tag ABA member(s) and/or relevant topics in your posts. When using the online platform, type the “@” sign and begin typing a member’s name (first, last). 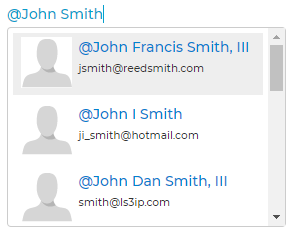 A dropdown list will pop up with members who match the name you typed. Select the correct member, and they will be tagged in your post. If you’re not sure that you have selected the right member, visit their member profile to confirm before tagging them. When a member is tagged in a discussion post or library item, they will be notified. 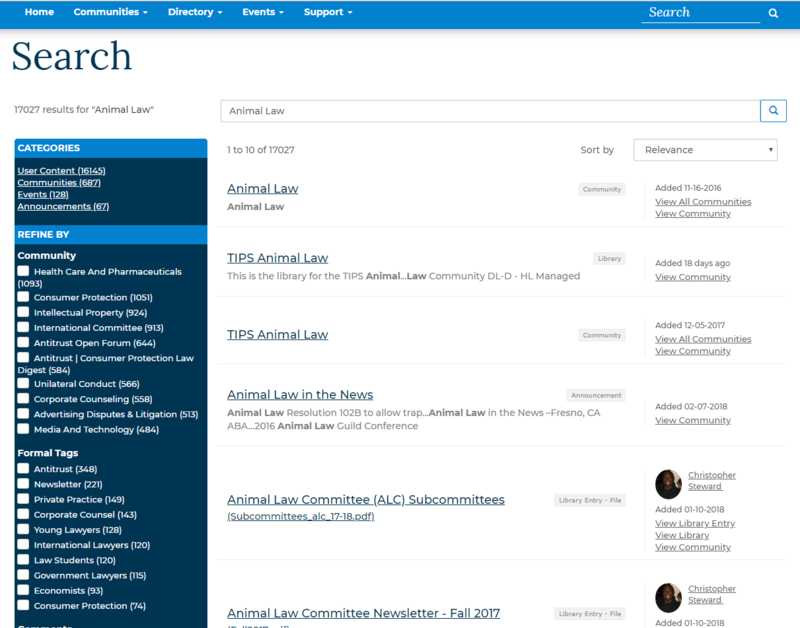 When using the online platform, type the “#” sign and begin typing a topic or committee name (all committees and ABA website topics are available in ABA Connect.) A dropdown list will pop up with relevant tags. Click the tag you want to add, and it will be included in your post. Q: Can I delete my discussion posts? A: You can edit your discussion posts after they have been published, but only a Community Administrator can delete discussion posts. Discussion threads are set up this way to protect conversations and archiving. If you would like to know more about archiving and/or deleting discussion posts, please contact your Community Administrator. Q: How do libraries get populated with items? When you include an attachment in a discussion post, it is automatically placed in the library. You can also upload documents directly to the library by using the “Create New Library Entry” in the community’s “Library” tab online. Library items are not required to be associated with a discussion thread. Q: What types of files can I upload? A: You can upload various file types including standard files (Word, Excel, PowerPoint, PDF), videos, images, hyperlinks, and embedded YouTube videos. Q: Is there a maximum file size? Q: How do I upload a library item? Compose a new email in your email provider i.e. Outlook, Gmail, Yahoo, etc. * When you upload items via email, they will automatically be placed in the general community folder. You must visit the community Library in the online platform to move your file to the correct folder and/or make any other changes. Q: What are Library Item “tags”? A: Tags are a great way to organize your documents and assist in searchability. You can help others find the file you uploaded by including tags when you upload it. There are many pre-loaded tag categories to choose from. Q: Who can see my library items? A: Everyone in your community can see your library items, except when you “Reply to Sender”. Depending on the community settings, other ABA members or the public in general may be able to see your library items. For more information about specific communities and privacy, contact your Community Administrator. Q: What is a Community Event? A: A community event can be a meeting, webinar, conference call, etc. relevant to your community that does not require a purchase or formal registration like your entity’s Annual Meeting or CLE sessions. If your community has enabled Community Events, you can create events like impromptu get-togethers, recurring conferences calls, or other informal gatherings for your community. For more information about Community Events, contact your Community Administrator. A: From your community home page, click on the “Events” tab. Then, click on the “Add Event” button. Q: What is a Community Blog? A: A community blog provides a space for all community members to publish long form articles and posts relevant to the communit topic. If your community has enabled Community Blogs, you can create posts to share with your entire community in the online platform. For more information about Community Blogs, contact your Community Administrator. Q: How do I create an blog post? A: From your community home page, click on the “Blogs” tab. Then, click on the “Create a New Blog Post” button. For more information about Community Blogs contact your Community Administrator. Q: How do I find a Community Member? A: From your community home page, select the “Members” tab. This provides a directory of all community members, including a search based on First Name, Last Name, Email Address, and Company Name credentials. Q: How do I find an ABA Member? A: In the main navigation menu, select “Directory”. This provides a dropdown menu including separate directories for your entity or the entire ABA. Both directories include search capabilities based on First Name, Last Name, Email Address, and Company Name credentials. A: Contacting a fellow ABA member in ABA Connect is easy! Once you’ve found the ABA member you are looking for (search is available in the Member Directory or under the “Members” tab in a particular community), click on their name to open their member profile. From their member profile, you can “Send Message”, “Download vCard”, and/ or “Add as Contact” in ABA Connect. When you request to add a member as a contact, they must approve your request before they appear in your contact list. PRO TIP: You can directly message a member from their discussion post or library item by selecting “Reply to Sender” in the discussion reply options.